More than 200 Durham, North Carolina residents stood outside a jail on Thursday, attempting to turn themselves in for the removal of the city’s Confederate Soldiers Monument—to protest the arrests of eight people who have been accused of dismantling the monument. The group chanted, “Thank you, we love you,” in support of those who were arrested. Takiyah Thompson was detained Tuesday evening after climbing the statue to knock it down, and faces both felony and misdemeanor charges for disorderly conduct, damage to property, and inciting a riot. Four other activists were arrested on Wednesday as well, followed by three who turned themselves in on warrants. The statue was toppled days after a white supremacist rally in Charlottesville, Virginia, in which neo-Nazis gathered under the pretense of protesting the planned removal of a statue of Confederate General Robert E. Lee. A coalition of racist groups carried torches and chanted “Jews will not replace us!” and “Blood and soil!” on Friday night while a man identified as a neo-Nazi was accused of driving a car into a crowd of counter-protesters, killing 32-year-old Heather Heyer and injuring 19 others. Many who supported the counter-protesters questioned the arrests of Thompson and the other activists on Wednesday, while no arrests had been made in the case of a group of suspected white supremacists who severely beat a black man, Deandre Harris, in Charlottesville on Saturday. 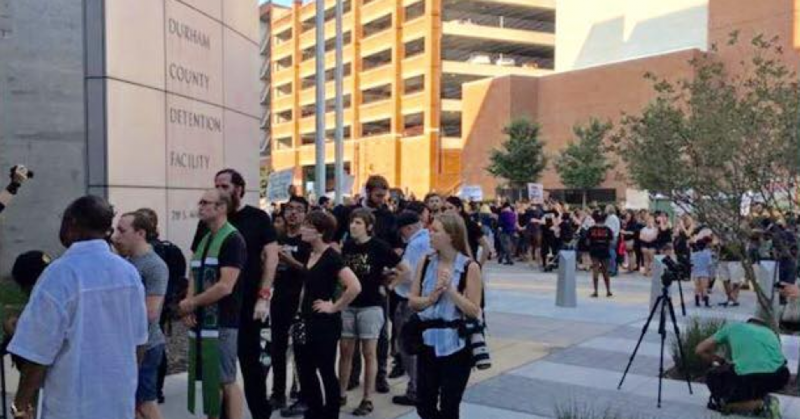 Most of the people in Durham who lined up to turn themselves in were doing so symbolically and in solidarity with those who had taken the statue down, according to a report in the News & Observer. Police declined to allow people into the detention facility unless warrants had been issued for their arrests.